Jakarta DPRD sets total amount of City Budget 2019 draft (RAPBD) as much as Rp 89.08 trillion.
" I am grateful for council approval towards RAPBD 2019"
Jakarta Governor, Anies Baswedan stated, RAPBD 2019 increases by around seven percent from City Budget 2018 which is Rp 83.26 trillion. "I am grateful for council approval towards RAPBD 2019. 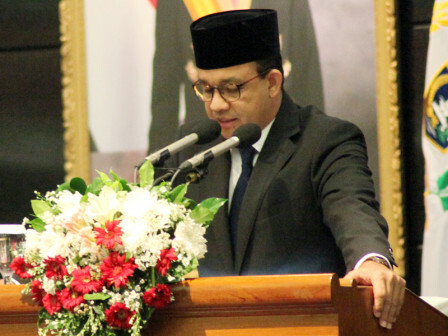 Insya Allah, it can be benefited for Jakartans," he said at Jakarta DPRD Building, Wednesday (11/28). Meanwhile, Jakarta DPRD Deputy Chairman, Triwisaksana hopes SKPDs can use this budget well. Considering total budget allocated in RAPBD 2019 is Rp 89.08 trillion. "Alhamdulillah, we are agreed that our APBD in 2019 is Rp 89 trillion. We hope this budget can be realized well," he stated.